Downy Woodpecker on palm tree - one of my neighbors - Nikon D300 Nikkor AF ED 80-200mm f/2.8D lens @ f/4 ISO 200 1/500thOn weekday afternoons while I am at my desk editing photos or putting up blog posts like this one, I often hear a dull, repetitive sound coming from just beyond the back patio. 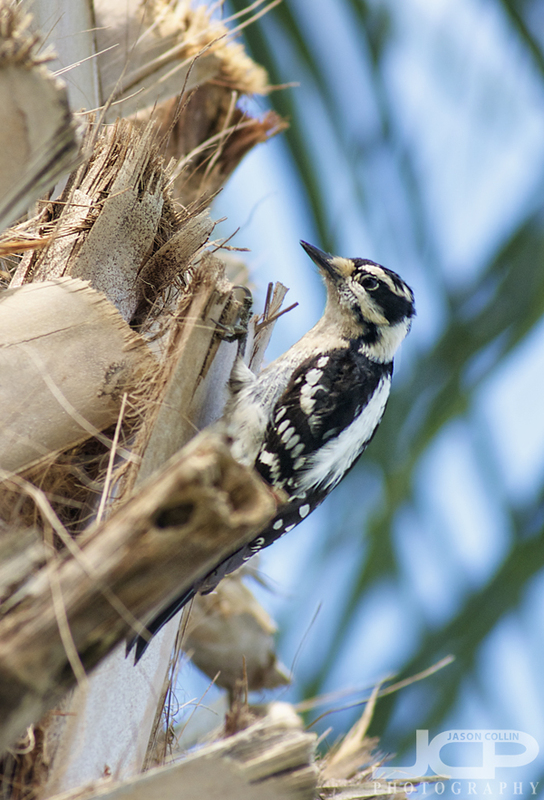 The sound signals my neighbor, a downy woodpecker, has returned to work on the three cabbage palms in my backyard. He (or she) is a small fellow and my longest lens is only 200mm, so I never really thought to try and photograph the woodpecker before. Well yesterday the downy woodpecker was pecking away a bit lower in the tree and with a bit of cropping, I was able to produce the above shot. Downy Woodpecker on cabbage palm in St. Petersburg FloridaIt seems strange doesn't it to see a woodpecker on a palm tree?